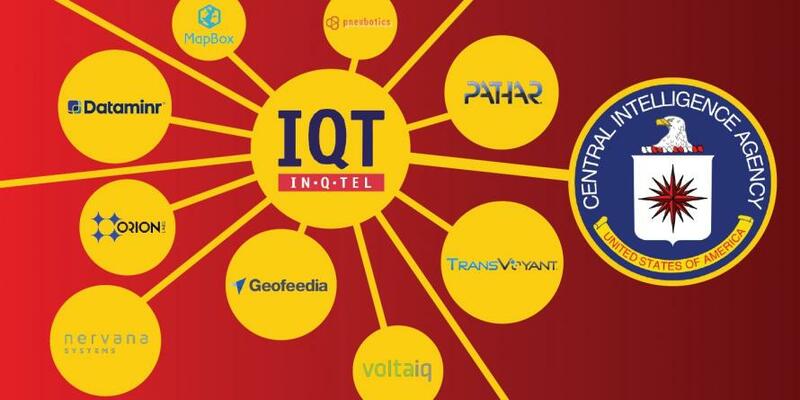 Today we highlight the most interesting investment firm on Earth: In-Q-Tel, the US Central Intelligence Agency’s venture capital arm. The “Q” in the name is an homage to James Bond’s quartermaster. The rest of the story is even cooler than that, and what they own is a useful signpost for the direction of many disruptive technologies. IQT has 186 active employees, with operations in the Bay Area as well as DC. The current CEO and President is Chris Darby, an Intel Corp alum. The lead partner is Steve Bowsher, who is based in San Francisco and has the usual Harvard/Stanford educational credentials common in the VC community. Why you should care: IQT knows how to pick winners and isn’t afraid to go it alone. It was, for example, the only outside firm that would invest in Palantir’s first round. That company, founded by Peter Thiel, uses advanced software and big data analysis to solve cyber espionage and other 21st century problems. The rest of the VC community passed, with some outright telling Thiel the idea would never work. IQT plunked in $2 million back in 2004 and got Palantir the connections to work with the US government on several serious cyber security problems. Which they solved. Fast forward to now, and Palantir’s value may be as high as $20 billion and there is talk of an IPO. Even if IQT’s original $2 million investment only gave them 1% of the company, they have a 100-bagger on this trade. SnapDNA. Portable chip-based DNA analysis. Identify anyone on Earth in real time by their genetic fingerprint. Magnet Forensics. Digital forensic analysis of evidence from computers, phones and tablets to fight crime and guard national security. Sonitus Technologies. In-mouth microphones and speakers to allow for secure and high fidelity communication in any environment. And one notable prior investment: Keyhole, a satellite imagery company. Sold to Google in 2005, where it became Google Earth. You can see more (including video of the in-mouth mike) here, and IQT’s website is here: https://www.iqt.org. 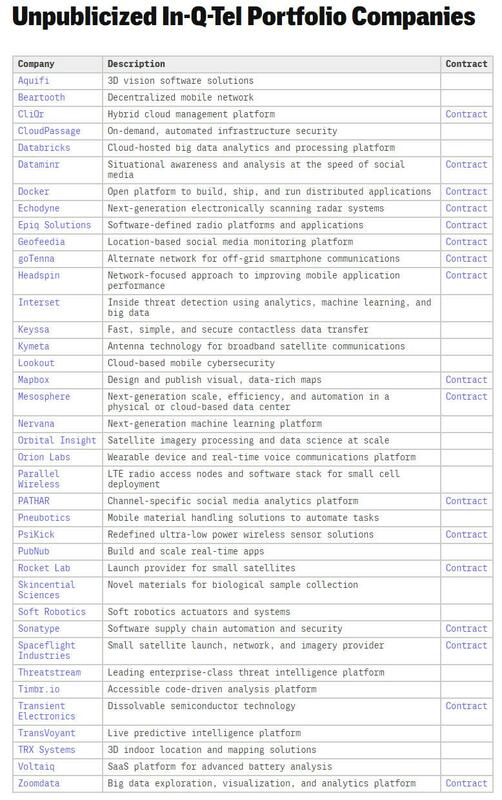 Separately, a list of unpublicized In-Q-Tel portfolio companies is shown below, courtesy of The Intercept. Bottom line: this is one of those companies to add to your “Smart money” list. When you see them make an investment, understand they have a real edge. And on a final note, Israel’s Mossad is following in IQT’s footsteps with a VC firm named Libertad Ventures. Their initial focus will be on robotics, energy, encryption, web intelligence, and natural language processing. They do not, however, intend to take equity. Or call out what they own.